A member of the Alice Springs Hatzimihail family, Alex, says he is pulling together investors for an educational and technical complex worth more than $500m in the Desert Knowledge Precinct. He says he is working closely with Chief Minister Adam Giles in having a special immigration zone declared so that thousands of overseas students can live and study here. Investors will come from countries including the USA, UK, Germany and Australia. Mr Hatzimihail says he’s also working together with “some of the world’s best universities” – details yet to be announced in three to six months’ time. He says he is negotiating with the NT Government for 40 hectares of land in the precinct and is working with the new DK CEO, Paul Davies, and former Aboriginal DK board member, Harold Furber. Mr Hatzimihail says he collaborating with Mr Giles to “crank up the Alice Springs economy”. Conditions being negotiated are six months of free rent, an undisclosed rent being paid for the land, and a shareholding for Desert Knowledge. 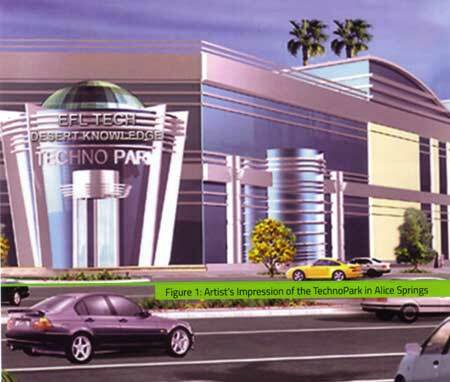 Pharmaceutical companies may also be part of the Desert Knowledge Techno Park to be set up in the precinct. One will be from obverseas and one from Australia. Another company, Kaz Pap Developments, will build smart houses and will later bring out 3D printed houses. “The first ones in Australia will be in Alice Springs,” says Mr Hatzimihail. As a university professor who often visits remote Australia and Alice Springs I would like for this project to happen. Given the grandiosity however it sounds unrealistic unless scaled back. Furthermore, to get international universities involved would involve collaborating with outside faculty (e.g., from US, Asia, Europe, etc). So, much more planning, input, and realism is needed here. Laughed my head off when I read this. Why would thousands of overseas students choose Alice Springs to live and study? Love the Alice myself but she’s unbearably hot and dry for many people. Cost of living is sky high and entertainment is all but non existent. It’s not the safest place to live. Institutions like the one planned work closely with industry so there are possibilities in health but not much more. There won’t be a special immigration zone and Chief Minister Adam Giles is not the person to talk to about that anyway. Mr Hatzimihail says he’s working together with “some of the world’s best universities”. If so have they found us on a map? This is probably a joke, Mr Hatzimihail is having us on. However, it is also a bit “out there” to make a helter-skelter attack on Scott McConnell’s very moderate, well considered and sensible observations about the proposals (Posted November 22, 2014 at 9:28 am). Whatever happened to our capacity for conducting civil discussion of public issues? It seems to have been subject to attempted homicide, in this case, by attack and battery, using exclamation marks. (By the way, I didn’t actually think that Scott was “placing as many obstacles as possible in the way of those who have the will and imagination to achieve something”, and from what I have seen that has never been his habit; far from it – he is somebody who is firmly anchored in reality). Scott’s main point was about the need for a “level playing field”, so that all contenders – especially local ones – can receive fair and equal treatment; an issue about which the Browns have been justifiably vociferous many times in the recent past. As Scott said: “The precinct is a public asset, albeit with caveats and limitations, but if commercial opportunities are going to be explored, when will these opportunities become publicly known? I presume that you would support the need for Adam Giles to answer these questions, Steve, now that you have had time to calm down a little? Gees Scott! And we wonder why Central Australia has been bogged down in Welfare dependency and misery! Those that are supposed to be leading the way have become so dependent themselves that they feel threatened by anything that might offer another way “Free Enterprise”! They are sitting on their proverbial, offering sarcastic comment and placing as many obstacles as possible in the way of those who have the will and imagination to achieve something. They are unable to see the woods for the trees, unable to see the intrinsic and quite enormous value of their own location. Not everybody has available land and transport! These are the very things that have created the new aircraft maintenance industry. They also have the ability to attract other kinds of industry. Now, sure, at first glance this project seems a little out there, but new industries always start with someone’s dream, someone’s belief. Having placed a few calls I hear that there is genuine interest from this group of people in establishing a project here. More importantly they also appear to have genuine connections with the means to make it happen. So instead of sitting in sarcastic judgement let’s give them every assistance! Actually, go out on a limb and help them. If it falls over well at least we’ve given it a chance. That’s how you create success, new enterprise, find people genuine work – BY taking some risk. We are the perfect hub for this. As impressed as I am to hear that there will be Central Australian input into an Australian-produced super car, with Indigenous design inspirations and kangaroo-skin seat covers, this is going to happen at the Desert Knowledge precinct? As part of a $500 million technology park? Something has obviously been lost in translation. Although there are varying opinions about the success of DKA to date, the original premise of the project was to work collaboratively and cooperatively across remote Australia to increase economic participation. It is my understanding that the precinct is a public asset, albeit with caveats and limitations, but if commercial opportunities are going to be explored, when will these opportunities become publicly known? When can other commercial operators have their proposals competitively assessed against a known criteria? Apology for the ongoing motor car analogy, but in the rhetoric, we seem to be driving a very fast car, but where are we going?